Like any writer, I need an occasional reminder that I can do this thing we call on Twitter “#amwriting.” It sounds so simple. You pick up a pen or pencil and apply it to paper, or you tap on a keyboard. Bingo, you’re a writer. Not so easy, as most writers know. Somewhere in the brain, between the creation of what you plan to write and when you actually put it into words, an assortment of messages can appear. Once in a while, the message may be, “Damn, this is sweet. Get it down on paper.” More often, the message is apt to be, “No one wants to read your crap. Go watch TV.” Or “You don’t have anything to say worth reading.” Often it can be, “Remember your last rejection? That agent/editor knew what she was saying. Give it up.” It takes resilience to be a writer, to overcome the criticisms, rejections, and self-recrimination that outnumber the tiny slivers of success by far. I’m always looking for inspiration and advice about how to buoy the human spirit after a plummeting defeat. Yesterday, I found an unexpected one. I spend more than half the year living in Outer Cape Cod in a town bounded by the Atlantic Ocean on one side and Cape Cod Bay on the other. Life is supposed to be easy here. Cape Cod is blessed with endless breathtaking beaches for swimming and surfing, lobsters, clams and oysters for eating, and bike paths and hiking trails inspired by Thoreau. I’m not particularly adventurous when it comes to outdoor sports, having grown up under an odd admonition about what activities are “lady-like” and constant warnings about what is not safe. I’m working on that, but while I do, I frequently watch and admire others who know no fear. Brave the elements. Fall down and get up. Surfers on Cape Cod are my go-to inspirations. All year long, young and old, surfers brave the relentless surf. Age and gender are irrelevant. Each summer, surfers compete in the Cape Cod Oldtimers Longboard Classic. I am as fascinated by these human creatures of the sea as I am the whales, seals and yes, sharks. I go from beach to beach, usually later in the day, to watch surfers in their wet suits tote their boards down steep sand embankments into the frothy sea. I silently send messages out to them when I think a good wave is coming, as if I were their partner, but they have minds of their own and pick their own wave. They climb up, sometimes gracefully, more often clumsily. The moment they capture that wave, ride it triumphantly, even if it is only for a few seconds, I feel their elation. More often they fall before rising, or never even climb up. No matter, falling is irrelevant. There is always another wave, another chance. You need only to get up and try again. 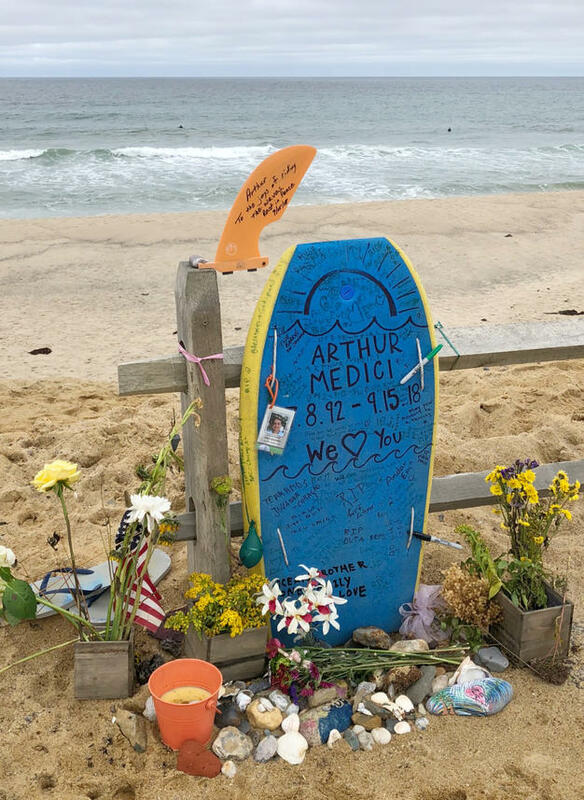 Yesterday, I rode to Newcomb Hollow Beach where a young surfer died from a shark attack several weeks ago. Much has been written about the tragedy. There I photographed a memorial for twenty-six year-old, Arthur Medici, with messages of love and support. If you look in the distance beyond the memorial, you will see two specks of black in the ocean. Surfers. While you may question the wisdom of taking to the sea, you cannot question the power of resilience.